André Verdier's stylish and super sharp Country steak knives are perfect for everyday use. The Country series knives' handles are made of natural wood in a mix of: olive, oak, beech, wenge, paduk and bubinga. 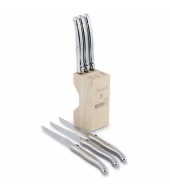 André Verdier's stylish and super sharp Debutant Inox knives are perfect for everyday use. 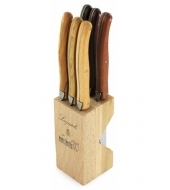 The package contains 6 Laguiole steak knives with serrated stainless steel blades in a practical wooden block. 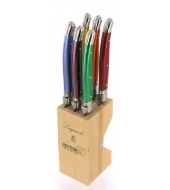 Absolutely beautiful Laguiole steak knives! 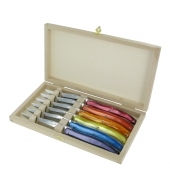 Choose between many colours and if you would like the blade to be with or without serration. André Verdier's stylish and super sharp Debuntant Floraison steak knives are perfect for everyday use.